This is our next project. When Davy built our offices this land was left unattended. He had quite gransiose plans for it but when he was ill he lost his mojo and wouldn't let us plan it for him. Consequently it has been a terrible eyesore for the last couple of years and not a very appealing sight right in front of our beautiful offices. We now plan to make it his memorial garden with a water feature and benches where anyone can rest awhile and contemplate the universe, eat lunch or whatever. 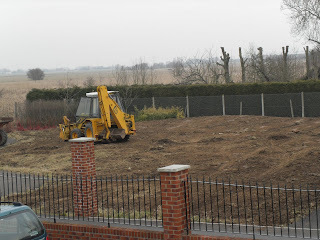 We got off to an inauspicious start when the neighbour complained that the digger had damaged his wire fence. He came storming into our office with his wife and started shouting his mouth off, but we managed to calm him down when it was explained it had actually been deliberately cut at some time, probably by the ragtag druggies that stole Davy's bike from our garage. We commiserated on the appauling state of crime in this country and he left the very best of friends, well maybe not quite, but at least friendlier. I should probably add that when I say "our next project" it is actually the project of the kind and able people that populate the office together with the practical assistance of our gardener and our maintenance man. I shall not be getting my hands dirty. Gardens are to admire, not to sweat in. We are now wondering what to call this garden. Some wag suggested we call it "Fuckwit Corner" because Davy absolutely loved this word and would occasionally be known to use it but I think that we should be able to conjour up something a tad more suitable. And finally ......Apple announced today that it has developed a breast implant that can store and play music. The iTit will cost from $499 to $699, depending on cup and speaker size.. This is considered a major social breakthrough, because women are always complaining about men staring at their breasts and not listening to them. What a wonderful idea. I meant the garden not the iTit! I think the garden is a great idea too - no suggestions as to what you could call it though. Between you, you are sure to think of something apt. A garden will be a lovely memorial to Davy. I know it will give you a lot of solace to sit out there and feel him surrounding you. I think Apple will outdo itself for women when they develop the iNuts as we all know how useless they are already. Good to see your wry wit and sense of humour coming back and to hear all your news and plans.Contessa and I continue to hold you both dearly and daily in our thoughts.Davy was amongst other things, the most inspirational man we have ever known, and his guidance will inspire you Ann in choosing a name which does his memory justice. Kevin, our third has returned to our roost recently, and is currently on the path we chose to follow. I know Davy had a hand in it as I have asked his help to instigate the motivation and it has worked as I knew it would. Love you Contessa and Pea. What a lovely idea to have a memorial garden. I agree it deserves a much more grandiose name than the one already thought of! That's a great idea, whether you call it Fuckwit Corner or not! LOL! I wish you would, though! Love the joke about the musical breast implant too - OH will appreciate that one! Oh Maggie, don't you like the idea of the iTit? There you are Maggie, Anne liked the iTit idea. I hope you have a patent out on that idea aims. Wonderful news Contessa, but you always had faith that Kevin would be OK one day. I guess of all the children Kevin was the one that Davy was most worried about. His charm and charisma could have been his undoing, but thank God he has got the message at last. And thanks for your tribute to Davy. He surely was an amazing man and still continues to influence so many lives. Hi Addy, how are you doing? We walk the same path at the moment don't we? Do you know jay, I am coming around to the idea of Fuckwit Corner. It was so "him"! But aim's idea of an iNut is inspirational isn't it Lisa. Or on a bad day it could be reverted to your original idea. Dear RAC, you make me laugh, as always - the iTit is a great idea! Thank you so much for visiting me and offering words of wisdom = how true. So sorry that you lost your Davy at Christmas. And I know how you feel about the invasion = lovely to have them but what has happened to your life? I've now decided that this IS my life and it's no good wishing it away.. Life, maybe a different one, goes on. And aren't we lucky that it does. Much love, and thanks, to you. Keep your chin up. PS The garden will be lovely, I'm sure.